Description: The playground that is her mind. I'm giving my points to the simplicity of your blog. You are categorizing your blog as a semi-personal blog so I guess it's fine for me - Clean and Simple, yet looks Elegant at the same time. The drawback with this is you are actually giving a boring atmosphere to your readers. The long list of posts with no cuts on the index or main page gives an impression of TLTR - "Too Long To Read"
Content's width appears to narrow. No Favicon and no logo, means lesser impact and retention. The header doens't tell anything about the blog itself. Though, I do understand that this is all about the personal thoughts of the blogger. 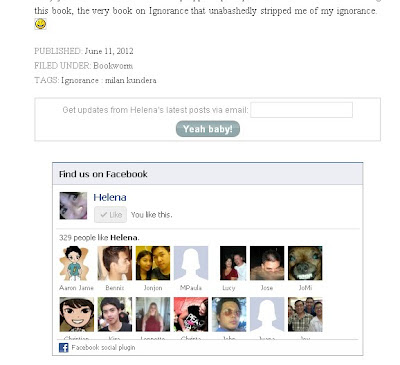 On the other hand, it seems to be fine and it stands out and speaks for itself, "hey, this blog is all about Helena's thoughts". The problem is you can only think of that if you know who Helena is. Other than that, if I saw your site on SERP, it would not catch my attention at all, thinking - "who the hell is Helena is?". About Page - Looks decent for me taking in consideration the niche where you belong. The credentials below are worth mentioning. Just a little more fix on how the article was formatted. It looks messy in my opinion ( I'm talking about the layout of the post and not the content ). Contact/Hire page - first of all, let me say that you do look pretty. :) Though you may want to fix the width of your picture, it seems too big for the page -- too eye catchy. Another thing to point out is when you say "contact" or "hire" page, shouldn't it be ALL about how they can contact you? The way I'm reading it, I find it as an extension of your "About Page". Content itself - You are a good writer. I'm giving my points for you that! You really show your talent very well in my opinion. There is nothing more I can say about this. The only issue I've got is it seems that you are tackling a wide span of ideas turning it to a General Info blog. Do you know the phrase "too much is bad"? This part is also great since readers can instantly find this after they read your posts. Personal blogs, most of the time, have problems promoting themselves. Usually it is the question of "would other people care about what I think?". Not unless you are a celebrity or a person known on your career, I find it sometimes to relate on such posts. Though, one thing I think people would love to read about your articles is how you gave them advice on things. It looks like a whiteboard to me. Very neat. It is like placing a white paper on top of a white table. The content area doesn't stand out. Do not be intimidated by color. For the header, title bar or menu bar, I suggest to use another color to make it standout. I suggest to add an archive list on the menu bar for readers who want to search for old posts. I suggest for a home button. Honestly, I missed the section breaks and found myself dumbfounded that I am already reading another post. Play with your fonts-regular, bold, bold italic, etc. When we speak about blog branding, it is not all about the logo, colors and fonts that blogger's use. The blog should have a personality - a recognizable identity. Unfortunately, I got confused with this blog. The blog has personality but I am lost at it. I can't identify what the blog is for or what the central theme is. No doubt about her writing skills. She is very intellectual. Nonetheless, it doesn't compensate for the blog's lack of central theme that will glue the posts together and will create a recall among readers. I found one post about tips on preparing for board exam, book reviews then followed by personal ramblings, the list goes on... The posts should be cohesive, that you can achieve by creating a theme. Each post is independent from the others thus creating a chaos if you would compile the posts together. Too vanilla for me! In order to achieve impact, know your audience. The impression that you leave on readers depends on the usefulness and uniqeness of your blog. Honestly, I cannot find something here that can be useful for me. Based on these review and based on what have you submitted - you did mention that you are not sure of what category does your blog belong, well to tell you frankly, it seems that it goes under General Information mixed with some Personal ramblings. Taking that in mind, the question is, are you blogging for yourself or for your readers? That is usually the question that most bloggers and site designers and administrators forget. Answer that and you'll have a nicer blogging experience. She is such a good writer and I envy her writing skills. She might need some help on re-designing and branding her blog..